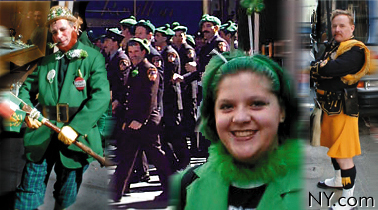 On Sunday, March 4, 2001 there will be St. Patrick's Parade in Queens, NY. Unlike the parade in Manhattan, this parade will welcome all who wish to share in the spirit of the day regardless of gender, age or sexual preference. The Irish Arts Center at 553 W. 51st Street presents contemporary and classic Irish and Irish-American plays. Call (212) 757-3318 for more information. Saint Patrick's Day, or the Feast of Saint Patrick is a cultural and religious celebration held on 17 March. The day commemorates Saint Patrick and the arrival of Christianity in Ireland. Christians also attend church services and the Lenten restrictions on eating and drinking alcohol are lifted for the day, which has encouraged and propagated the holiday's tradition of alcohol consumption. Patrick was a 5th-century Romano-British Christian missionary and bishop in Ireland. It is believed that he was born in Roman Britain in the fourth century, into a wealthy Romano-British family. His father was a deacon and his grandfather was a priest in the Christian church. He spent six years working as a shepherd and that during this time he "found God". Tradition holds that he died on 17 March and was buried at Downpatrick. Over the following centuries, many legends grew up around Patrick and he became Ireland's foremost saint. It is also widely celebrated by the Irish diaspora around the world, especially in Great Britain, Canada, the United States, Argentina, Australia, and New Zealand. In recent years, there has been criticism of Saint Patrick's Day celebrations for having become too commercialized and for fostering negative stereotypes of the Irish. People around the world celebrates the heritage and culture of the Irish by wearing a green attire. St Patrick is said to have used the shamrock or green attire, a three-leaved plant, to explain the Holy Trinity to the pagan Irish. New Yorkers have their own unique way of celebrating Saint Patrick's Day, the wearing of the Green. Green clothes, green flowers, and green hats are standard, but you'll also find unique green beers, green bagels, green water fountains, and even a green Empire State Building.